Mexican shrimp. Lime juice. 1 chipotle in adobo sauce. Wait, that last ingredient is clearly not in the recipe, our minds have a tendency to wander back to that thick, smoky sauce. However, if you can make it Paleo, why not add a little more unexpected spice on a shrimp fajita pan? Or let the chili powder, paprika, cumin, garlic and onion powders work their wondrous magic as they have been doing for eons. There is something so captivating, even alluring, about Mexican spices that always keep us coming back for more, they even make a beef cabbage skillet all that more enticing. Spices are essential to keep the love of food and eating alive. Even the humble salt crystal keeps us entertained with various colors and textures from the earth. Yet, the real star of this meal is the shrimp. One of our favorite seafood dishes is a simple 5-minute spicy shrimp. 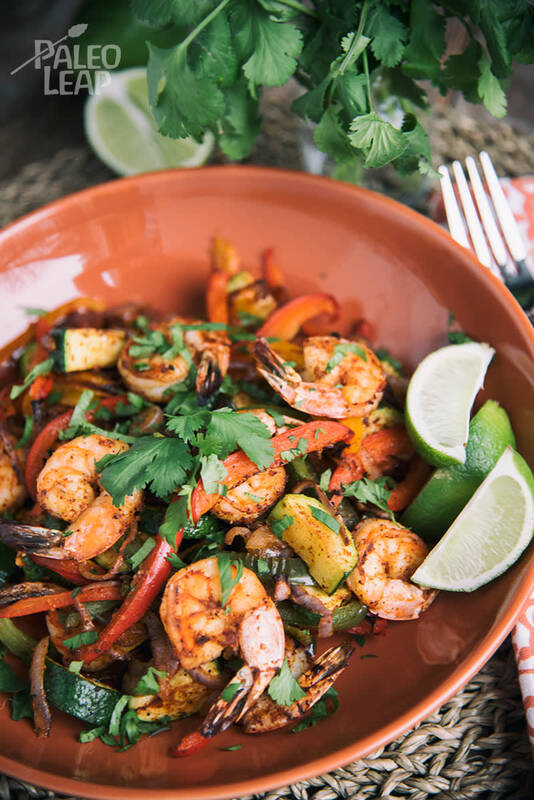 It is mouthwateringly beautiful, just as these pan-baked shrimp fajitas are. However, it’s not nice to choose sides when there are so many healthy options loaded with incredible flavor, so choose one for now, and make the other recipe later. Trust us, there are plenty of options in between, the only requirement is that you love shrimp. And we believe that you do, for you are already here. So, let us suggest another shrimp option that you may not have tried yet: how about Paleo hoisin shrimp with mango slices? Sounds delish to us! In a large bowl toss the bell peppers, onion, shrimp, olive oil and spices. Season to taste. Grease a baking sheet and spread the shrimp and vegetable mixture in a single layer. Bake 12 to 15 minutes, turning halfway.